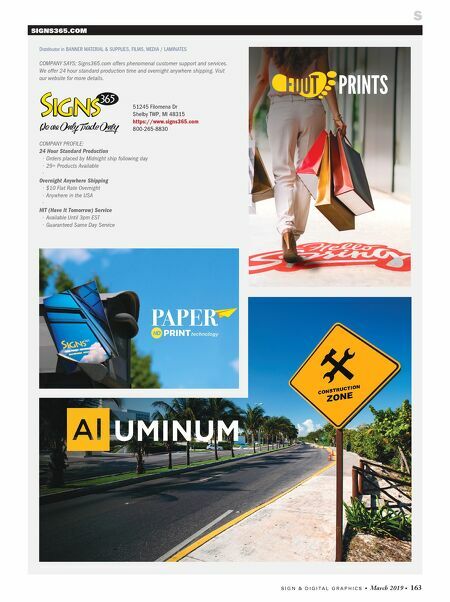 162 • March 2019 • S I G N & D I G I T A L G R A P H I C S SIGNTECH WHOLESALE Service Provider in WHOLESALE - (TRADE ONLY) COMPANY SAYS: SignTech Wholesale is dedicated to being your go-to supplier for wholesale printing. We work closely with sign shops, designers, promotional product companies, printers and more to supply grand-format digital prints and wide-format rigid printing. 59 Techview Dr Cincinnati, OH 45215-1980 http://signtechwholesale.com 513-984-3486 SIGNWAREHOUSE INC Distributor in DIGITAL PRINTING/FINISHING EQUIPMENT, DIGITAL PRINTING INKS, FABRICATION & INSTALLATION EQUIPMENT, LASER ENGRAVERS, MEDIA/LAMINATES, SCREEN PRINTING EQUIPMENT/SUPPLIES, SIGN & WRAP SHOP TOOLS/SUPPLIES, SIGN COMPONENTS/ HARDWARE, SOFTWARE, SUBLIMATION EQUIPMENT/SUPPLIES COMPANY SAYS: SIGNWarehouse is the world's leading distributor of Mutoh printers, Graphtec vinyl cutters, and SAi sign software. SIGNWarehouse offers a complete line of equipment and supplies for vinyl graphics, digital printing, garment decoration and more. 2614 Texoma Dr Denison, TX 75020-1053 http://www.signwarehouse.com 800-899-5655 • 903-462-7700 SIGNS VISUAL INDUSTRIES OF NEW YORK INC Manufacturer in ARCHITECTURAL & STOCK SIGNS, WHOLESALE - (TRADE ONLY) COMPANY SAYS: Signs Visual manufactures custom architectural signage for wholesale markets in the United States. Signs Visual specializes in metal etching, waterjet cutting, laser etching, cast bronze, metal engraving, metal polishing, glass etching, fabrication. 1514 Broadway New York, NY 10036-4002 http://www.signsvisual.com 212-945-8706 SIGNS365.COM (SEE LISTING ON PAGE 163) SIGNSCENTER.COM Manufacturer in ARCHITECTURAL & STOCK SIGNS, SIGN COMPONENTS/HARDWARE, WHOLESALE - (TRADE ONLY) COMPANY SAYS: From design to shipping, SignsCenter.com provides businesses with award-winning custom signs. We have built many signs that have become icons in the community. We serve a diverse spectrum of clients. 1607 NW 79th Ave Doral, FL 33126-1105 http://www.signscenter.com 800-260-7551 • 304-607-4467 COMPANIES S SIGNPRO SYSTEMS Manufacturer in ARCHITECTURAL & STOCK SIGNS, ELECTRONIC SIGNAGE (LED/NEON), SIGN COMPONENTS/HARDWARE, SIGNAGE DISPLAY/EXHIBIT SYSTEMS COMPANY SAYS: SignPro frames accommodate a multitude of sign substrates and fabrication methods, from printed paper inserts mounted with a protective lens to laminated prints, cut vinyl, photopolymer, ADA faces, engraved plastics, metal and more. 9033 Murphy Rd Woodridge, IL 60517-1100 http://www.signprosystems.com 866-724-1270 • 630-226-1155 COMPANY PROFILE: SignPro Systems, the wayfinding signage division of Orbus Exhibit & Display Group, is proud to provide affordable, modular wayfinding signage to the trade. 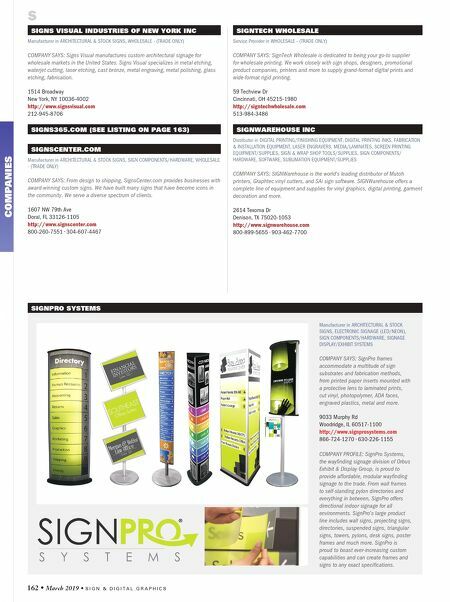 From wall frames to self-standing pylon directories and everything in between, SignPro offers directional indoor signage for all environments. SignPro's large product line includes wall signs, projecting signs, directories, suspended signs, triangular signs, towers, pylons, desk signs, poster frames and much more. SignPro is proud to boast ever-increasing custom capabilities and can create frames and signs to any exact specifications.